Copenhagen is a great city. One I had always wanted to visit and when I got there earlier this month I was not disappointed. Of the many things I liked, the one I liked more than any other was the fact that the city is made for cycling. I have cycled all my life and anything that frees me of being behind a steering wheel in slow-moving traffic is a godsend. On the Sunday I was there I cycled out to find where the University of Copenhagen was located so that the following day I would not have to worry about how to get there. The ride out there was, as I described in a previous post, a little long but really enjoyable. Cycling along the cycle lanes I began to see shots appear in front of me and realised I needed to get the camera out of its bag and be prepared. Over the course of the five days I was there I took many shots cycling past people and locations. Not ideal, but sometimes images appear and disappear in front of you so quickly that there really is not the time to dismount, lock the bike and get that shot. Of the images I brought back from Copenhagen this one has to be one of my favourites. 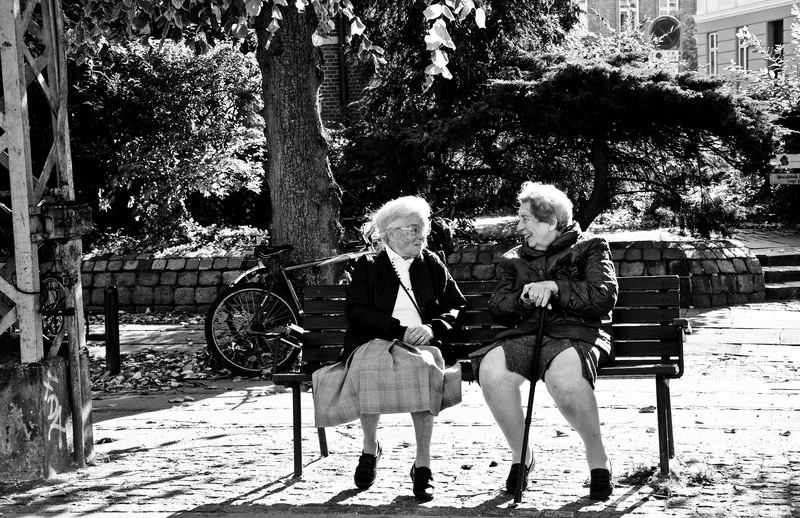 I rounded a corner and saw these two old ladies engrossed in their conversation about 20 metres ahead of me. Keeping one hand on the handlebars, I hoisted the camera and snapped as I passed them. I could continue to write about the image but it’s all yours now. Let whatever story you want to imagine emerge. Choosing an iPhone image to go with that beautiful shot needs something similarly tender and intimate. This couple with their contrasting black and white clothes. This entry was posted in Daily posts to Flickr, iPhone, photograph posts, Street Photography and tagged art, Beautiful Women, Best Friends Forever, black and white photography, Brendan Ó Sé, Copenhagen, Copenhagen Street Photography, Cycling in Copenhagen, iPhone, iphoneography, love, people, street photography, travel, writing.